Trio Transmitter is an innovative new music ensemble that presents inventive concert programs and interdisciplinary performances. It’s three members are internationally touring instrumentalists, composers, and music theater performers. Since its founding in 2012, Trio Transmitter has commissioned many new works from composers including Peter Ablinger, Hanna Hartmann, Neo Hülcker, Nuria Núñez Hierro, Christian Vasquez Miranda, Markus Wettstein. In 2019 the Trio presents its new three-part concert performance: Cells, Sounds & breeding Souls. Developed in cooporation with Bio Artist Margherita Pevere, the series is sponsored by a grant from Haupstadtkulturfonds Berlin. The trio has also received support from initiative neue musik berlin for its concert evening Transmitter 2015. 2016 saw the release of the Trio’s CD camera obscura on NEOS Music presenting solely world premiere recordings. Florian Bergmann explores and performs contemporary music and music theater through his multiple roles as composer, multi-instrumentalist, and performer. He has written pieces for many ensembles including international new music ensembles, soloists, jazz ensembles, children’s performances, and dance and theater pieces. As (bass) clarinetist and saxophonist he has appeared in festivals such as Acht Brücken Festival Köln, Festival D’Automne à Paris, Grec Festival Barcelona, Münchener Biennale, Musiktheatertage Wien, Glatt&Verkehrt Krems, Unerhörte Musik Berlin, Kontraklang Berlin as well as other places throughout Europa, the USA, Brasil, Taiwan, and Singapore. Since 2009 Florian has been a member of the alto saxophone quartet Fo[u]r Alto (with Frank Gratowksi, Benjamin Weidekamp and Christian Weidner) that explores microtonality and extended techniques on the saxophone. In 2016 and 2019 Fo[u]r Alto received funding from the Berliner Kultursenats. 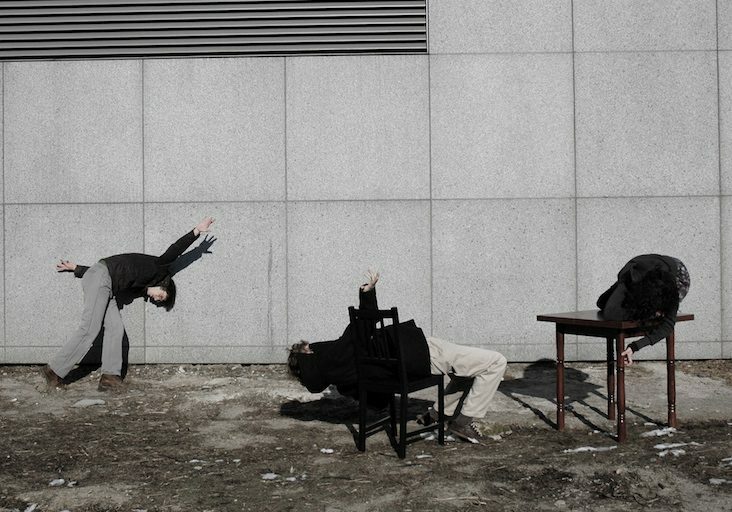 In 2017 Florian, along with Benedikt Bindewald and Minouche Petrusch, developed the musical performance project Klangquadrat, commissioned by Theaters o.N. in cooperation with the Deutsche Oper Berlin. Florian works frequently with the Deutsche Oper Berlin, Berliner Ensemble, with the Deutsche Theater and the Neuköllner Oper. From 2009-14 he organized the International Umlaut Festival Berlin, and from 2013-18 he was politically active on the board of the IG Jazz Berlin and with the DACH Musik. Florian studied at the Hanns Eisler school for music and at the University of the Arts Berlin. Italian pianist Alba Gentili-Tedeschi’s dedication to contemporary music and interdisciplinary art has thrived in her home base of Berlin. Always searching for new ways to expand her art, Alba explores meaningful artistic collaborations with composers, actors and visual artists. As a dedicated chamber musician, Alba performs frequently as part of the clarinet and piano Duo Kermani-Gentili, whose CD “Ode an die Rhapsodie” has just been released on the Genuin label. Alba is also a core member of Opera Lab Berlin, a collaborative ensemble for contemporary opera and theater. Her composer/performer Trio Transmitter, focused on contemporary and experimental music can be heard on the CD “camera obscura” released on the NEOS Music label. Alba has performed at festivals such as the Münchener Musiktheaterbiennale, FirenzeSuonaContemporanea, Infektion!, Kontraklang und Unerhörte Musik Berlin, and in venues such as Concertgebow Amsterdam, Tonhalle Zürich, Lingotto Turin, Staatsoper Berlin, Komische Oper, Neuköllner Oper, and Volksbühne Berlin. She has won competitions for both classical and contemporary music, and given the world premieres of numerous compositions. Alba studied piano with Silvia Rumi and composition with Irlando Danieli at the Giuseppe Verdi Conservatory in Milan. After graduating with first class honors at Milan’s Conservatory, in 2006 she moved to Berlin for further studies with Linde Großmann at the Universität der Künste. She received her Diploma in 2011, as well as completing studies with Piero Rattalino at the solo Academy Incontri col Maestro in Imola-Italy. Benedikt Bindewald is a violinist, performer, composer, and wandering musician. Born in Frankfurt/Main, grew up in Kalbach near Fulda, studied violin in Berlin and Bremen and composition in Berlin at the University of the Arts, played with the Deutsche Kammerphilharmonie Bremen, the Bremer Philharmonikern, the Ensemble Zwishentoene Berlin ,the Lunaire Quartett, the Maulwerkern, the Meitar Ensemble Tel Aviv, the Ensemble New Babylon and with many other ensembles, played in the Schauspielhaus Zürich, in the Berlin Philharmonie, in HAU Berlin, Schauspiel Hannover, Theater Bremen and all the lovely places with smaller names, loves working with Ruedi Häusermann, Daniel Ott, Dieter Schnebel, Thomas Klug, Misha Bolourie, Till Wyler von Ballmoos, Younghie Pagh-Pann, Rilli Willow and all the amazing people who aren’t yet as famous, created pieces such as PLASTIKFLUT, 28 Stunden NEUKOLLN ECHT LIFE FERNSEHEN, BABBEL, Präludium für eine Stille, CCTV in Operation, Dornröschen-Maschine, Zeit hängt im Baum, and many others, worked with traffic…, KLANGQUADRAT and CarrilonN_13¿, currently works with Die Auster Bunny, Trio Transmitter and the Henusode-Quartett, and sometimes wanders alone with his violin off the beaten path, knowing that the slower way is usually better. Benedikt Bindewald lives and works in Berlin.